Their God is so Big is a unique and indispensable guide to teaching Sunday School (up to the age of eight). Whether you're quaking in your boots about to face your first class of four-year-olds, or a battle-hardened veteran able to confidently perform the actions to dozens of children's songs, this is the book you've been waiting for. Their God is so Big is a unique and indispensable guide to teaching Sunday School to young children (up to the age of eight). It covers everything from understanding the kind of person you should be as a teacher to comprehending the rapidly changing stages through which children pass. Author Stephanie Carmichael offers a simple, practical method for preparing and delivering effective Bible-based lessons, as well as reams of suggestions, ideas and resources to help you handle everything you might face as a teacher. There's also plenty of advice and information on the mechanics of organising and running a Sunday School. 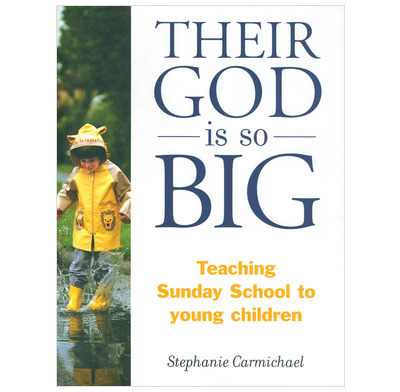 Stephanie Carmichael is a trained teacher with a long experience of Sunday Schools. Her seminars on Sunday School Teaching and ministry to children have been enthusiastically received in venues across Sydney. She is married to Ian and they live in Sydney with their children Lauren and Glen.